Getting Started with Game Maker shows aspiring game developers how to create their very own, professional-quality computer games, no programming knowledge required. Using Game Maker's simple, drag-and-drop environment and following along with the step-by-step instructions, you'll learn how to create arcade-style 2D and 3D games complete with graphics, sound effects, and music. Game Maker provides everything you need to create, test, debug, and run your games in a Windows environment. Even if you're brand new to game development, you'll be able to make a working game that you can play and share others. And not having to worry about the programming the game allows you to focus on the design and how to make the game more fun and challenging. Along the way you'll learn the basic principles of game development. And if you want to create more complex games you can take advantage of Game Maker's built-in Game maker Language that allows you to develop highly advanced games and applications. So let's get started! Written for beginners with no prior programming experience. 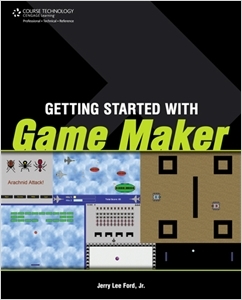 Readers develop their programming skills while building games using Game Maker's simple drag-and-drop interface. Jerry Lee Ford, Jr. is an author, educator, and an IT professional with over 19 years of experience in information technology, including roles as an automation analyst, technical manager, technical support analyst, automation engineer, and security analyst. He has a Masters in Business Administration from Virginia Commonwealth University in Richmond, Virginia. Jerry is also the author or co-author of 28 other books including Microsoft Visual Basic 2005 Express Edition Programming for the Absolute Beginner, Microsoft WSH and VBScript programming for the Absolute Beginner, and Microsoft Windows Shell Script Programming for the Absolute Beginner. He has over five years of experience as an adjunct instructor teaching networking courses in Information Technology. He lives in Hanover, Virginia with his wife, Mary, and their children Alexander, William, and Molly.